"Don't worry! I'm on the story and will save the humans from wallowing in their ignorance!" 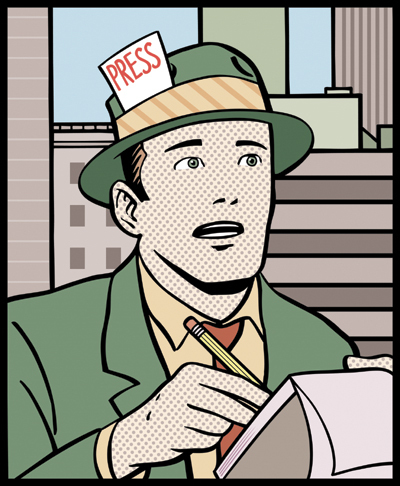 Journalism is a day in day out grind and has the added problem of trying to combine exalted purpose (think about the public service performed by exposing Tiger Woods or Balloon Boy and blanket covering OJ) with the harsh reality of needing to act like a business. Tough stuff. Mother Teresa did not have to do both of these things – at least at the same time. I work with journalists every day, count several as friends and believe that as a group they get an unnecessarily bad rap. That said, occasionally space at Proper Propaganda will be devoted to discussing the least awesome moments of the fourth estate. Let’s break this down a bit. I would argue that anyone who does anything in a haphazard/half baked manner is likely to fail. I have failed a lot in life and haphazardness has definitely played more than a bit part in this. Moreover, the possibility of screwing up is greatly exacerbated when you are playing in a dynamic, young realm with shiny toys like Twitter and Facebook that are reputed to be panaceas. The internet is still “new” by many definitions and social media is a veritable babe in the woods. Marketing in these channels is thus fraught with peril and the chances for failure are very high. So, of course, if anyone proceeds in a manner that does not tie tactics to strategy, their marketing efforts are liable to go over like the Hindenberg. What a revelation this story has foisted upon us mortals. Now I see the light.